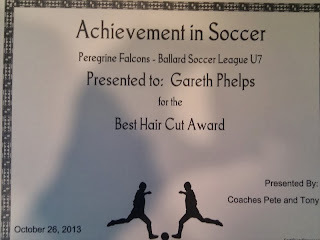 Last weekend, while I was playing at Benaroya, Gareth had his final soccer game of the season. One of his best friends was on the opposing team, so we arranged for them to pick Gareth up and take him to the game and to his team's end of season celebration afterward. Of course, the one week that I'm not there is the week he scores his first ever goal in a game. And he didn't even bother to tell me about it when he came home! I have a feeling that if I'd been at the game he would've been super-excited about that goal in the moment, but I guess all the ice cream and arcade games and playing at his friend's house afterward overshadowed the goal or something. 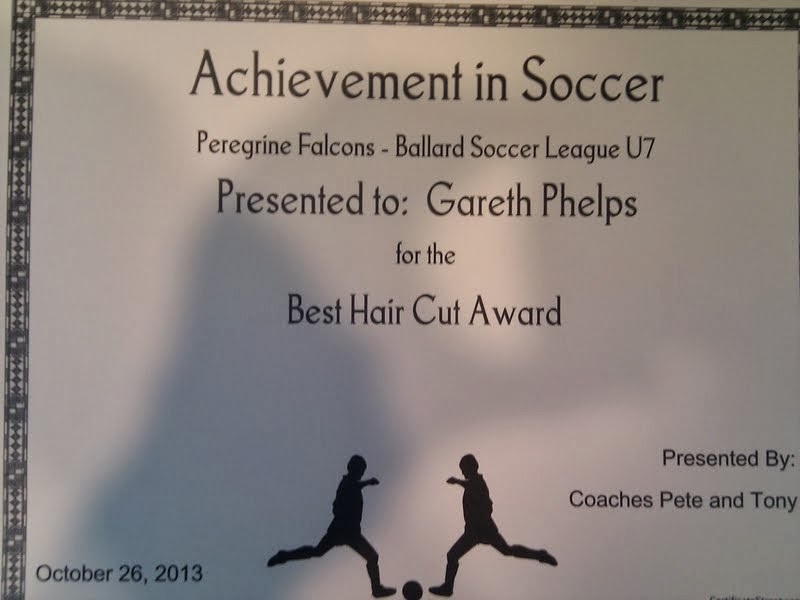 Yup, his coaches along with just about everyone else were pretty shocked when he showed up with his hair cut. It seems to have been a good season - despite tears of frustration at times, Gareth usually enjoyed himself, the coaches were great with the kids and Gareth is already talking about trying to play on the same team as his friend next year.